Rice is a staple comfort food for many cultures. Getting perfectly cooked fluffy grains every time you cook rice is something only master chefs are capable of. That being said, there are plenty of appliances that will assure you of perfectly cooked rice every single time. But, the great thing about such appliances is that they can easily double as cookers for other food stuffs too. Take, for instance, the Instant Pot IP – DUO60. This is a wonderful device which comes with a promise to perform 7 different functions and lift the pressure off your cooking and does not stop with cooking rice alone to perfection. With the functions and features that spell quick efficient cooking and consuming 70% less energy than other electric cookers in the market, this definitely seems to be a handy kitchen appliance to possess. Made with the best of technology, this pressure cooker not only cooks your food, but also keeps it warm until consumption. Let us see what are the best features and functions of this product. This is a pressure cooker which performs seven multiple functions like that of a pressure cooker, slow cooker, rice cooker, sautéing/ browning, yoghurt maker, steamer and warmer. The product comes compliant with 10 safety mechanisms certified by UL and ULC (Underwriter’ Laboratories of Canada). This is a product which comes with energy efficient technology. This kitchen appliance which has ample, easy to use control panel with 14 micro-processor controlled programs, dual pressure, and three different temperatures for sauté, slow cooking and keep warm mode. It also comes with a 3-ply bottom stainless steel cooking pot and a stainless-steel steaming rack with handles. The Instant Pot IP – Duo60comes with a manual that has simple easy-to-follow instructions and recipes that reflect the scope of this valuable kitchen gadget. The 14 micro-processor controlled programs provide for different cooking modes and a variety of cuisines in 4 different languages, English, French, Spanish and Chinese. The embedded micro-processor intelligently and constantly monitors and adjusts the temperature and pressure level in the appliance making it a reliable tool for churning out perfectly textured and adequately cooked dishes. The exterior of the pressure cooker is made of brushed stainless steel material. This is a great value addition to your kitchen and cooking ventures. Let us run through the advantages and drawbacks of this pressure cooker. The IP – Duo60 is a multi-tasker and can perform a variety of cooking functions with quickness, ease, and perfection. It is energy efficient and consumes less energy even when used for a long period. This single appliance performs the function of many devices and is simple to use in your day-to-day busy schedule. The design is very sleek and the gadget itself occupies limited space on a kitchen counter and hence can come very handy in small kitchenettes. The IP – Duo60 is just the appliance you need when you want to shift to a healthy balanced diet. This is one electric cooker which produces nutritious food by retaining maximum nutrients and flavour in the dishes. It cooks dishes to perfection and no more burnt or over cooked or under cooked food. The automatic temperature controls enable your dishes to turn out just the way you want them to be. This is one kitchen appliance that can be left unattended, because it is perfectly safe and weaves its magic on the outcome of any dish. The Instant Pot does not require constant monitoring. The Instant Pot IP – Duo 60 can be cleaned easily. The convenience of cleaning this one easy gadget is much more appealing than cleaning and scrubbing several pots and pans in the absence of this multi-functioning pressure cooker. The body of the IP – Duo60 is made up of brushed stainless steel and therefore it is solid and sturdy. The keep warm function ensures that the food cooked stays warm and healthy until the time it is consumed. The multi-functioning and programmable ability of this one appliance ensures that a variety of dishes from soups to rice to chicken and steamed vegetables can be cooked at the same time. The pricing is high and not for everyone who look at budgeted kitchen solutions. Though the price is relatively reasonable when compared to the number of gadgets and devices that this one appliance can replace, it still may be out of budget limits for some. The user manual may come with easy instructions. However, it may take some time to get used to this cooking device and some may even find the multiple instructions a little unnerving to follow. Also, people who are new to cooking or who do not cook regularly may find this gadget a little difficult to use. This device needs to be used regularly if one is looking at comfortably using this appliance. It isn’t the easiest appliance to cook with if one is not familiar or comfortable using pressure cookers. There have been complaints that cooking with the Instant Pot could take a long time when compared to the stove-top cookers because of the relatively low electrical heat and consequent low pressure. When there are power fluctuations, this electrical gadget may not be able to work to its full potential. 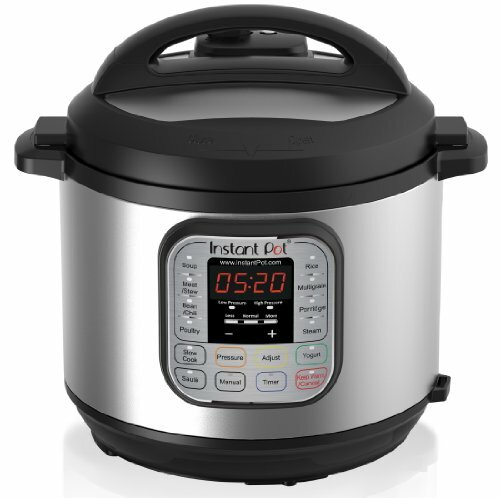 The Instant Pot IP – Duo60 7-in-1 multi-functional pressure cooker as the name indicates performs many functions when compared to traditional stove top cookers or other electric rice cookers and electric instant pots. At the press of a button, this Instant Pot can whip up a variety of dishes and does not require constant monitoring unlike its other competitors in the market. There are many fancy electric pressure cookers which do a lot of multiple functions. The materials used in some of these cookers may be fancy non-stick. However, the Instant Pot IP – Duo60 is made of stainless steel, which is a very safe material for cooking and one need not have any tension of non-stick residue which poses a potential health hazard. There are no steam leaks in this IP – Duo60 unlike some of its competitors. It retains the steam and flavour of the food. Once the cooking is done, it automatically shifts to the keep warm mode. The Instant Pot IP – Duo60 is a technology-friendly solution for modern cooking needs. The 6 Quart capacity of this cooker is ideal for the modern small families with busy schedules and most recipes too assume this size. The IP – Duo60 can perform an array of functions from steaming vegetables to cooking rice and beans and lentils, making soups and pot roasts. The cooking is done in a faster and more convenient way without your constant checking and a healthy style too which retains nutrients in the food. This is a cooking appliance which makes nutritious food that is consistent in quality and tastes better because of the perfect textures. The cleaning-up after the cooking is easier and is a wonderful alternative to other devices, pots and pans that may be required for cooking. This one appliance performs the functions of many other cooking equipment, and hence a space-saver too. It is totally worth the price you pay for it. The Instant Pot is a durable product which can stand the test of time and can be comfortably used for daily cooking as well as party cooking. This is a thoughtfully designed cooker that is completely safe, convenient, and reliable.